There are plenty of lady comediennes who are active today, in this here day and age set in the modern times. Stand up, improv, movie and TV actresses — it surely is a brave new world where women can be unashamedly funny. Even writeresses like us are allowed to be funny! Good for us. Good for everyone. But in the early days of film, when even being an actress was seen by society and family as being almost worse than prostitution, being a FUNNY actress was possibly even more disgraceful! In the early days of the last century, women were more or less meant to be demure and mannerly, sophisticated and subdued. Ladylike, I guess is the word. Boss ladies were frightening and masculine. Vamps were TYPICAL WHOOOORES and would do no good for any men, especially not leading man types. But still, both of those kinds of ladies had the chance of becoming domesticated and reformed. 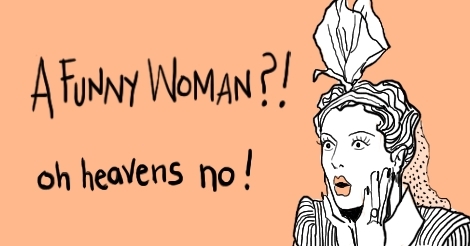 But a goofy, hilarious woman… well, what could be done with her? Did anyone even want to try? For some reason men then, and if we are being honest, some men even today, think that women shouldn’t be funny, or even can’t be. It SICKENS them. How? Why? What? Pardon me while I digress for a moment. Could it be that these people don’t like that humor must involve a clever mind? Is it intimidating to experience a woman being able to wield an actual good pun, or to cause others to laugh because she must be a certain level of smart? Do they think that the women are just being buffoons and it saddens them? Slapstick and physical comedy requires athleticism — I imagine people who don’t think women should do these things also believe that they should not engage in sports. I’m mad! I’m fightin’ mad! I’m also really sleepy and that’s why this is sleepy-scattered instead of my usual caffeine-scattered. Anyway. There were a handful of comic actresses on the silver screen. Sometimes, the big names would dabble, maybe to expand their ranges because they had grown bored with their craft of just drama. Katherine Hepburn could crank out a screwball when she wanted to, because she had the brass to do whatever she pleased, always. Carole Lombard was clearly a silly gal at heart. Lucille Ball. 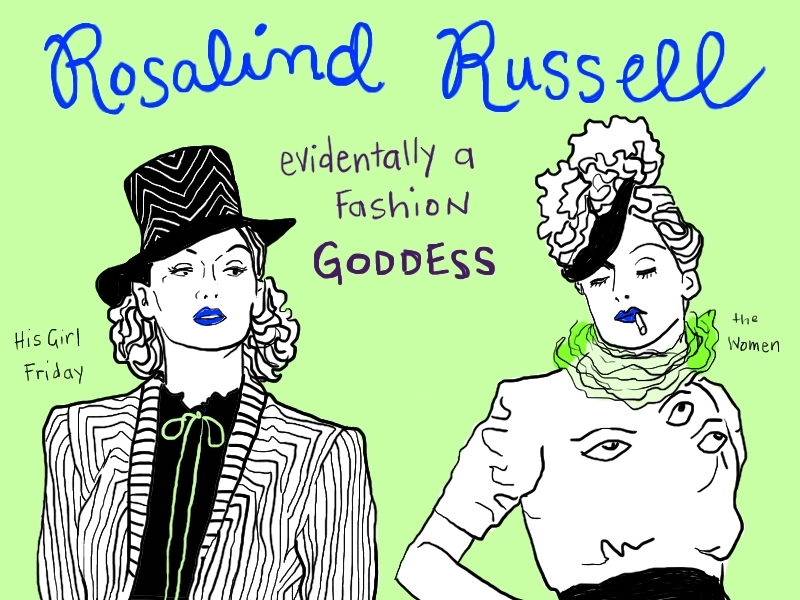 But Rosalind Russell, I just learned, started out her career way back in the late 1920s WANTING to be a comedy actress. Sure she could wear elegant gowns as well as anyone, but she also looked great in some of the most outlandish clothes that were ever burned to black and white film. I watched His Girl Friday last night, and not only was she funny, catty, snide, and interacting with Cary Grant, but she had on this bold dress that I think everyone in the world should be wearing right now. Let’s make that happen. I declare right here and now that I shall watch many more films starring this fine actress who I suspect might be underrated. I certainly hadn’t known to appreciate her as much as she deserves. But things change! They can even change for the BETTER.